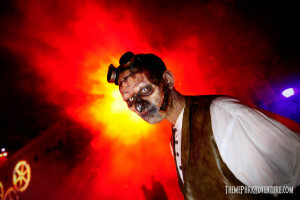 Six Flags Magic Mountain has transformed once again into Fright Fest, a large-scale Halloween event featuring 7 mazes, 7 scare zones, and several stage shows. 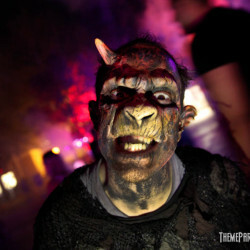 Monsters lurk throughout the park once the sun goes down, showcasing the world-class makeup of Scott Ramp and his amazing team of artists that work to transform more than 100 men and women into terrors of the night. 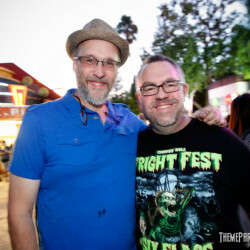 We’ve said this before, and I’ll say it again (and again and again) – Fright Fest here in Southern California is a truly underrated event that always seems to linger in the shadows of other theme park haunts in the region. 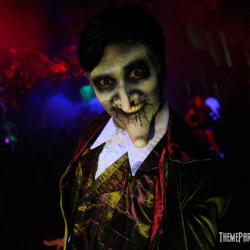 It shouldn’t, because what Magic Mountain does each Halloween season is truly great – and deserves to be on everyone’s To-Do list for October scare stops. 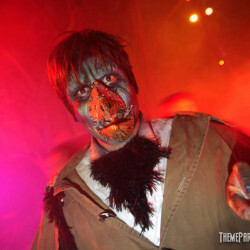 This was our second year attending Fright Fest, and we had just as much fun this time around as we did in 2014 because of the scale of the event and the added fun of some world-class roller coasters thrown into the evening’s mix. 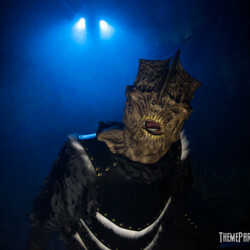 The headlining addition for Fright Fest 2015 at Magic Mountain is the all-new scare zone, Terrortory Twisted, located in the Screampunk District attached to Twisted Colossus, which debuted earlier this year. 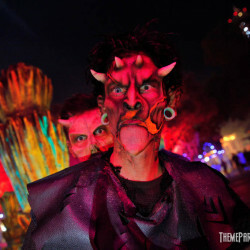 If you haven’t yet been on Twisted Colossus, that alone is reason to head to Magic Mountain – the crazy monster designs that Scott has created for the Terrortory Twisted talent is the crazy good icing on the cake. 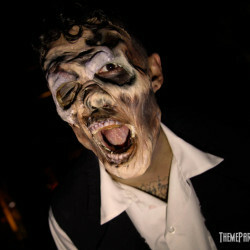 When you’re not running away from these ghouls and mechanized spooks, take a close look at their makeup – under their skin, you can see gears and cogs – truly inspiring work by Ramp and his team; something that Magic Mountain should be very proud of, because it’s badass to the bone – literally. 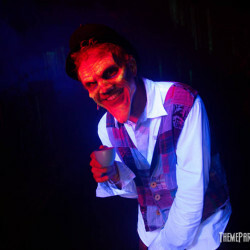 The other scare zones featured this year at Fright Fest are Sinister Circuit, which is located in the DC Universe section of the park, featuring the “signature” clown style/look of makeup that Scott Ramp is well-known for creating; Demon’s Door, located at the front of the park where denizens of the underworld attack arriving/leaving Fright Fest guests; Zombie Xing, which is very dark, foggy, and full of hungry undead; Exile Hill, which is high atop Samurai Summit, where menacing monsters slink and slither near the Willoughby estate; Nightmares – A Twisted Fantasy, which is a unique black light area between Viper and Tatsu that features glowing ghouls from fairy tale lore; and The Wastelands, an apocalyptic landscape ruled by barbarians and machines. 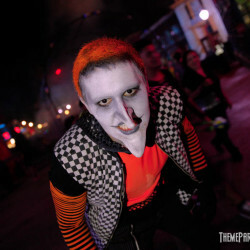 When you visit Fright Fest at Magic Mountain, you have to take time and check out the incredible character design/makeup in each of the zones. 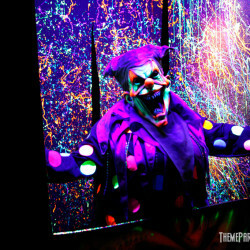 It’s seriously some of the best work we’ve ever seen for a large-scale haunt like this anywhere, and I’m sure you’ll agree. 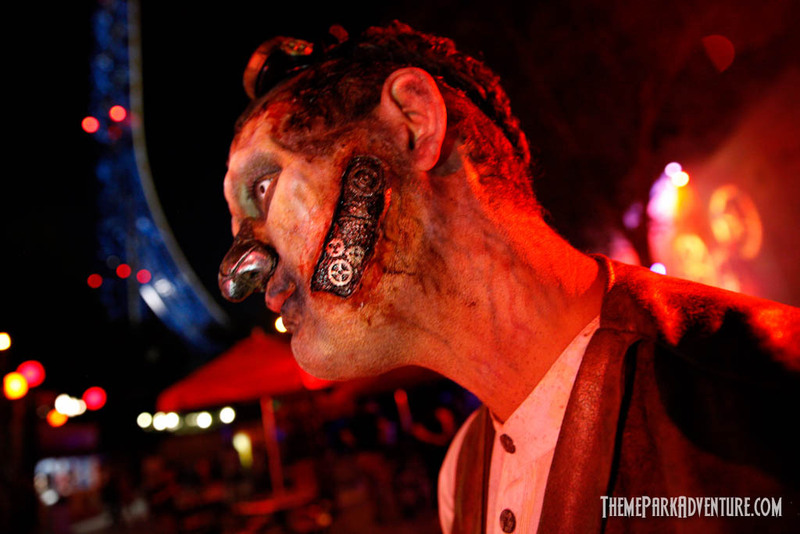 Even if you don’t pay to experience the event’s mazes (more on that in a moment), you can still check out the makeup all over the park; it’s one of the “free” perks of visiting Magic Mountain during the Halloween season. 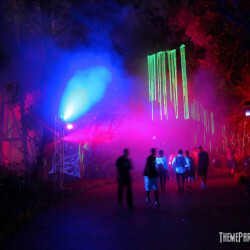 Willoughby’s Resurrected – The cornerstone maze of the event, Willoughby’s Resurrected is located high up on Samurai Summit, near the entrance to Ninja. 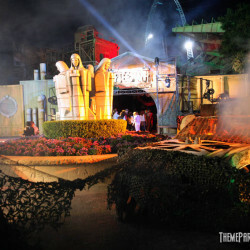 This is one of the more elaborate mazes at Fright Fest, due to the fact that most of it stays safe and intact inside year-round. 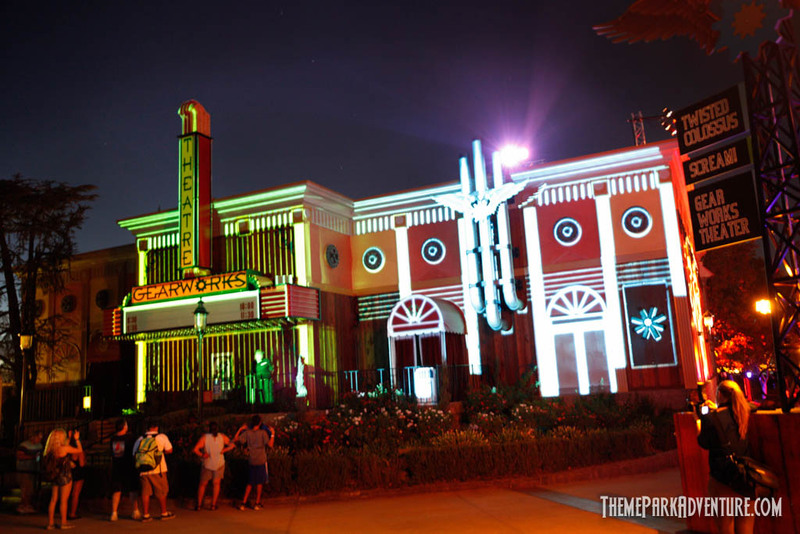 The building it occupies used to be the Magic Pagoda, a funhouse-type walk-through attraction that was a popular oddity decades ago at Magic Mountain. 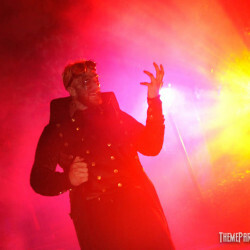 Featuring cool set design and special effects, Willoughby’s Resurrected is one of the best mazes at Fright Fest, and should definitely be on your must-hit list. 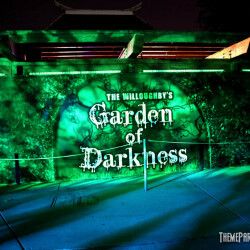 The Willoughby’s Garden of Darkness – Continuing the whole Willoughby estate theme on Samurai Summit, the Garden of Darkness is a covered hedge maze/labyrinth-style attraction that is mostly dark and fairly prop-free. 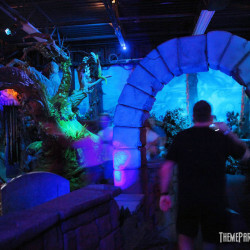 While the talent gives it a good go and pops in and out of the faux foliage scenes, this is one of the weakest mazes at Fright Fest, and is definitely pretty low-ranking when it comes to fan opinion of the event. We tend to concur, and wouldn’t be heartbroken to see this go away for something new to take its spot in the lineup for 2016. 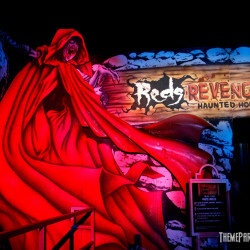 Red’s Revenge – Located backstage, fairly close to Full Throttle, Red’s Revenge was the maze that blew us away last year when we visited Fright Fest. 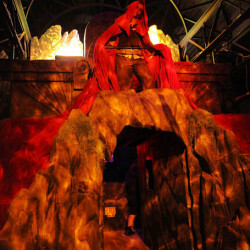 A horror-styled version of Red Riding Hood, the attraction is highly-detailed, featuring elaborate sets, dramatic show lighting, special effects and a cast of really enthusiastic actors. 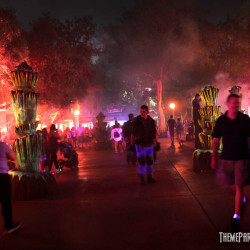 The maze hasn’t changed since last year, and while we were blown away in 2014, it was pretty much as we expected it would be this year, so the “wow” factor was a bit diminished. 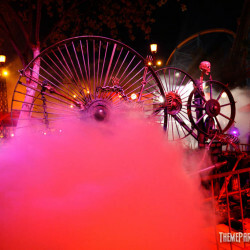 If Red’s Revenge returns in 2016, we’d like to see some of the scenes changed; it’s always good to give returning mazes a fresh look, whether it be a new scene or a new effect somewhere – fans will always respond well to change if the thrills are kept fresh and exciting. 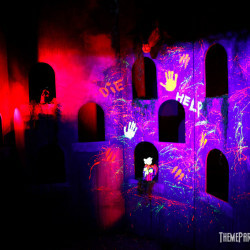 This is by far, one of the best mazes at Fright Fest and shouldn’t be missed. 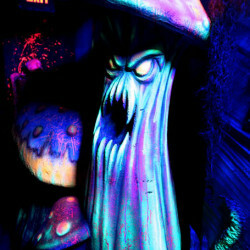 Toyz of Terror 3D – It’s always spookier when haunts spell their attractions with “z” at the end! 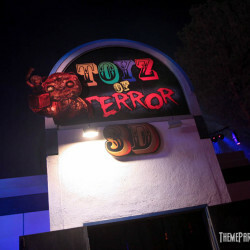 That aside, Toyz of Terror is your typical 3D maze in that it’s bright, and most of the walls/flats are painted in a “graffiti” style with colors that pop. 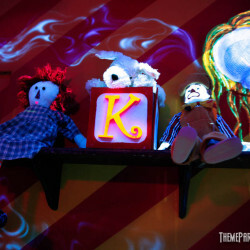 This is a wild toy factory environment filled with evil playthings. This maze is fairly strong as far as 3D mazes go these days; it’s bright, the use of 3D painting technique is well-executed, and the talent in the maze is definitely on the ball. 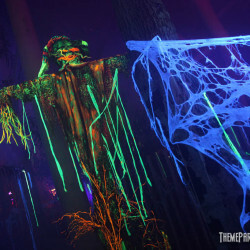 We’re just not huge fans of 3D mazes anymore, so by default, we’re only mildly excited to experience this particular attraction at Fright Fest each season. 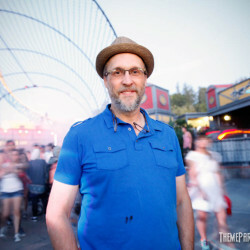 That doesn’t mean it’s bad – we just would love to see Magic Mountain (and other parks) move beyond the whole 3D thing and focus more on elaborate, truly dimensional environments. 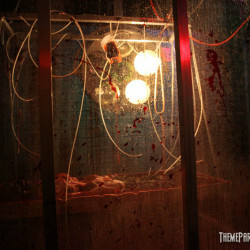 This maze is also located backstage near Full Throttle, where several other haunted attractions are clustered. 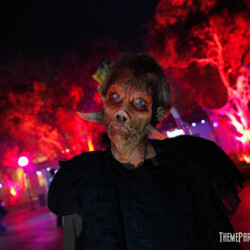 Chupacabra – Based on the Latin America folklore tale of a mythical beast that roams the land at night sucking livestock dry of their blood, Chupacabra plays up the theme well, albeit definitely one of the older mazes at Fright Fest. 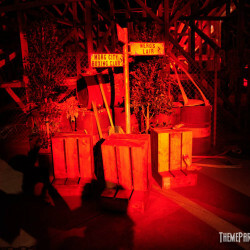 Located near the entrance to X2, Chupacabra suffers from extremely low lighting in most of its scenes and corridors; so much so, that guests really can’t tell what’s going on between the darkness and loud soundscape. 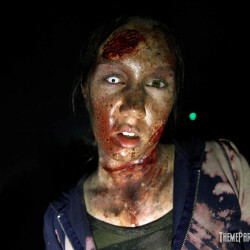 Last year’s version was much stronger when we went through, with talent engaging us and telling a story in the first major scene; we didn’t get that this year, so it’s unknown if we simply hit the maze at an off time, or that element has been stripped this season from Chupacabra. This is a really cool theme, but it seems that it may be time to retire the maze completely. 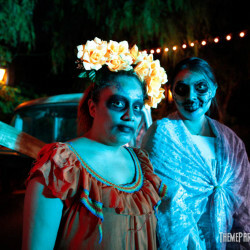 Perhaps Magic Mountain could carry on the tradition and have a really neat La Llorona maze, or one that showcases various folktales stemming from Mexican and South American cultures; we’d be all about that! 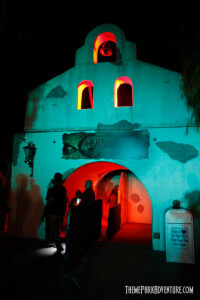 This year however, Chupacabra is one maze that can be missed if you’re pressed for time at Fright Fest, but worth a look if there’s little to no wait involved. Vault 666 – It still kills me that Magic Mountain is ballsy enough to title anything using “666” in the name; I can only imagine the complaints this probably generates, and I say kudos to them for going for it and keeping with it; I don’t think any other theme or amusement park would even attempt to go there, so hat’s off to the spookmasters at Magic Mountain for being fearless! 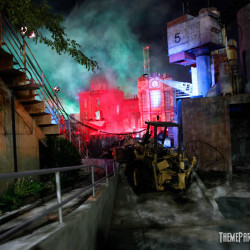 One of the newer mazes at Magic Mountain, Vault 666 is located backstage near Full Throttle, and is themed as a genetics lab where crossing humans and animals has gone terribly wrong (not that there is a terribly right in that scenario). 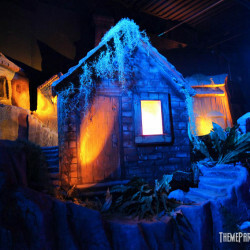 This is a really fun walk-through that is filled with special effects, cool props and nice show lighting. There weren’t as many actors when we went through as we got to encounter in 2014, so that was kind of a bummer. 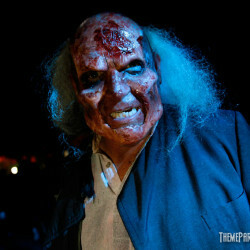 We could tell however, that Vault 666 has held up well, and remains one of Fright Fest’s strongest offerings. 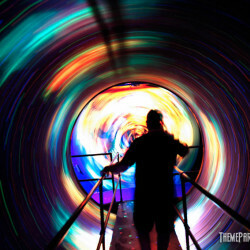 Definitely be sure to hit this maze when you visit! 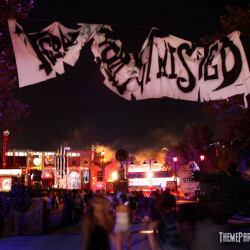 The Aftermath – This is my favorite maze at Magic Mountain this year, due to the sheer scope of it, as well as the enthusiasm of the cast. 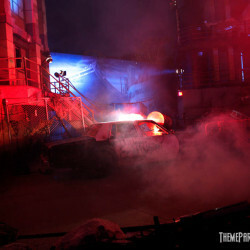 Set in the old Batman stunt show area, this large, outdoor maze features an apocalyptic environment complete with burned-out vehicles, live fire effects, and hostile mutants at every turn. 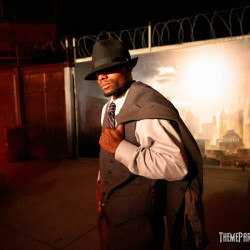 Aftermath features a great soundscape complete with sirens, gunfire and explosions. 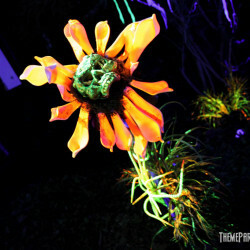 Bright bursts from a fire pot cast harsh shadows over the maze and illuminate its components, which Magic Mountain wisely salvaged and incorporated from the previous show that took up the space. 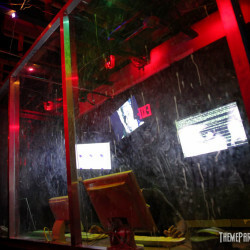 This is a long maze, with a theme that is ever-popular, placing guests in the middle of a virtual first-person shooter, for the lack of better explanation. I love it, and hope that it sticks around for a while – although for the long-term, I have fingers crossed that Magic Mountain fills this footprint with a dark ride similar to what the other Six Flags parks have been receiving, because the park desperately needs one. 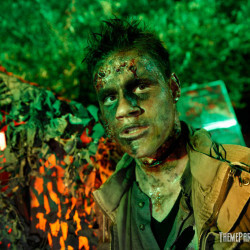 Whatever you do, check out The Aftermath – this is a great maze that delivers solid scares and a big “wow” factor. 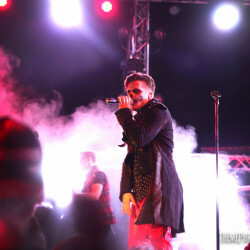 There are a couple of extra features worth mention, simply because they are presented as part of Fright Fest’s 2016 lineup. The first is X2: Satan’s Domain. 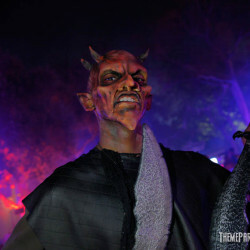 Once again, huge props to Magic Mountain for having the balls to incorporate “Satan” into the title of one of its attractions; everyone else shies away from calling out the Devil by name or direct reference (such as “666”), but not this event. 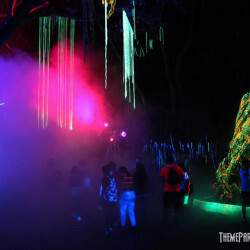 Not that Halloween events necessarily need such themes or references – it’s just nice knowing that Magic Mountain isn’t hesitant to go there, you know? So, X2 is one of the park’s signature roller coasters; it’s an old Arrow design that is so rough, I personally am not a fan, nor do I ride it very often. 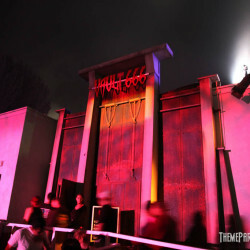 With it being called out as Satan’s Domain, however, we were curious and made the decision to check it out. 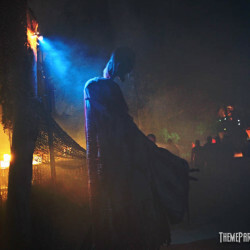 Unless things have changed since our visit, Satan’s Domain is non-existent; there is no overlay to the long walkway to/from the coaster (a missed opportunity, although thematically, it might land too close to Demon’s Door scare zone’s), nor is there any theming in the queue. 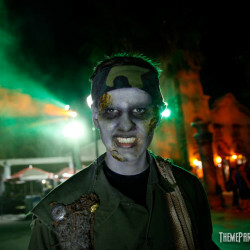 That leaves the soundtrack onboard the coaster itself, which we were told by employees featured a scary Halloween mix. 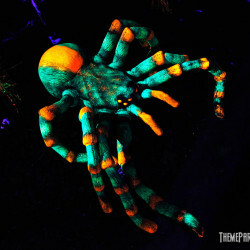 I’ve gotta say, the soundtrack is really so not scary or in-your-face (ear?) “evil” that had we waited more than 5 minutes for this, I would have been really pissed. And while not directly related to Fright Fest, I have to say, my ride on X2 was so damned rough, that I don’t care if I ever ride the coaster again. 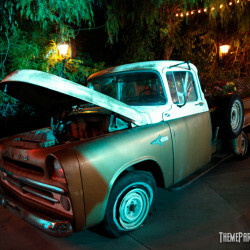 I’ve been “jackhammered” on wooden coasters that have gone bad before – but never a steel one, until now. Screw that. Either bring on X3, or nuke the whole thing from orbit – I don’t care which. 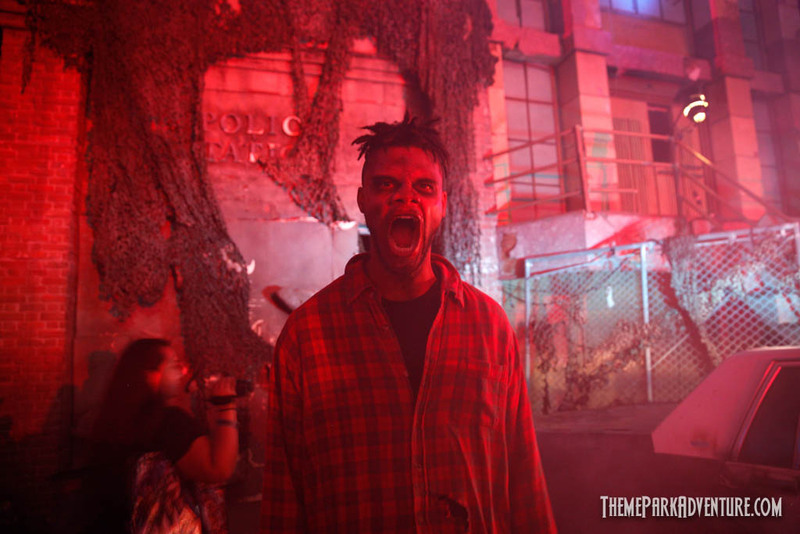 Unless you’re a die hard X2 fan (and I know, there are plenty of you out there), avoid Satan’s Domain at all costs when visiting Fright Fest, because the Devil is a liar – there’s nothing spooky about it, except the harshness of the ride itself! 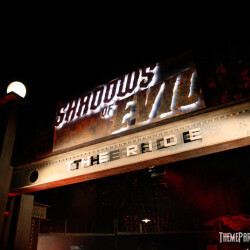 The other component that’s billed as a feature of Fright Fest this year is Call of Duty: Black Ops 3 Presents: Shadows of Evil. Boy, what a corporate-agreed mouthful! 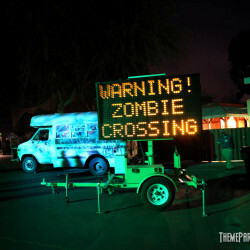 This is located at the entrance and somewhat in the queue of Apocalypse, toward the back corner of the park. 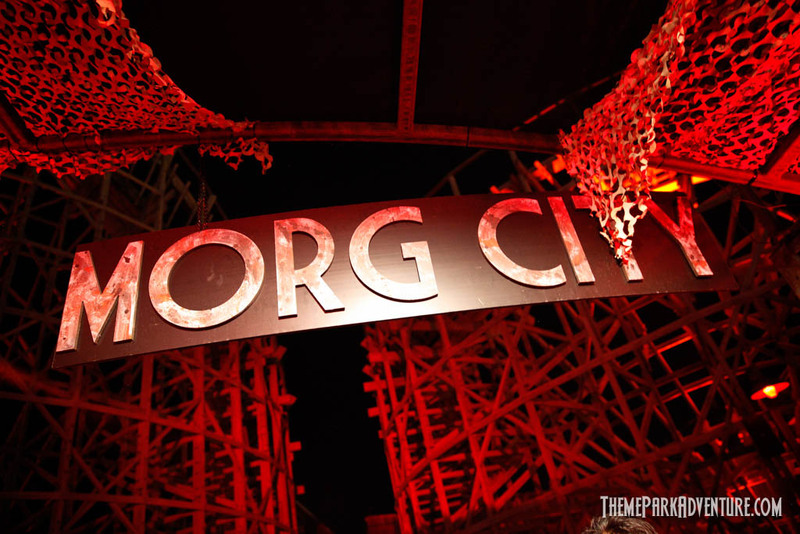 There’s a cool photo op location set up at the entrance of the queue (marketing for the video game), and the queue is set up to take on the theme of Morg City, where guests waiting to ride the coaster find scary props and encounters along the way. We didn’t want to ride the coaster, so full disclosure – we didn’t check out the queue to see how extensive the overlay truly is. 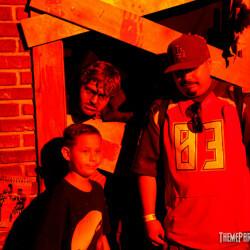 The photo op at the entrance is cool, though, and free. 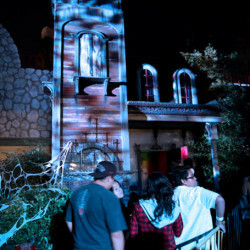 I also believe this is the first time that a Fright Fest component has been located this far into the back quadrant of Magic Mountain, which is a good thing; anything to spread the crowds out for an event such as this is a positive for guest flow. 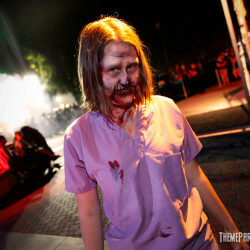 There are several entertainment offerings at Fright Fest this year, which really balances out the event as a whole, offering something for everyone. 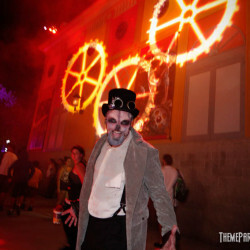 This year, the entertainment includes the High Sierra Hypnotist, located in the Golden Bear Theater; VooDoo Nights dance/DJ party located near the front of the park outside of Full Throttle; and Unleashed! 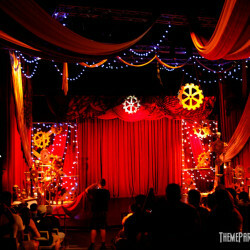 an all-new stage production inside the Gearworks Theatre (newly-renovated theatre in the Screampunk District near Twisted Colossus). 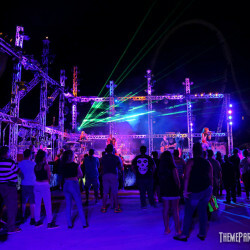 VooDoo Nights is definitely a crowd favorite, with loud club music pumping and high-energy dancers doing their thing all night long, turning the plaza outside of Full Throttle into one massive party. 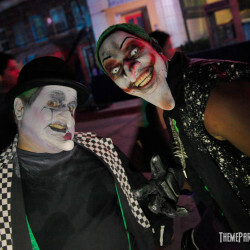 While we’re definitely not the target audience for VooDoo Nights, I think it definitely is a strong component to Fright Fest; as we’ve observed at many theme park/large attraction haunts, people love to dance and simply hang out. 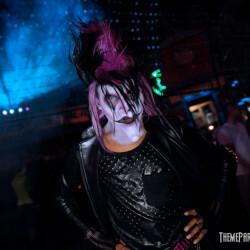 The entertainment here is family-friendly, and we saw guests of all ages enjoying the non-stop show, which begins after dark and continues until the end of the night during Fright Fest. 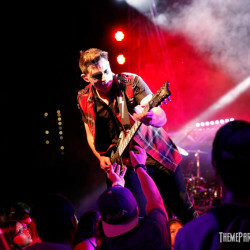 Unleashed! 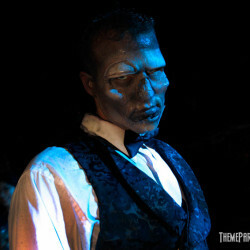 is a Cirque-like show in some regards; kind of a cross between Cirque and a dark talent show featuring Halloween-like productions/performances. 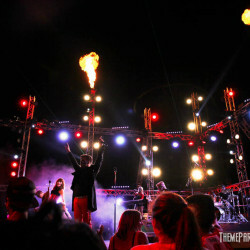 While I personally am not a fan of park shows/entertainment, I’ve got to say that Unleashed! is really entertaining, and definitely worth a watch, especially if you want a place to cool your heels during the evening. 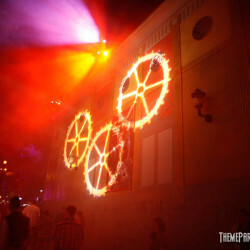 The outside of the theatre is definitely something that you should check out as you pass through the scare zone, because Magic Mountain has put together a really clever registered projection package for its exterior that really looks good. 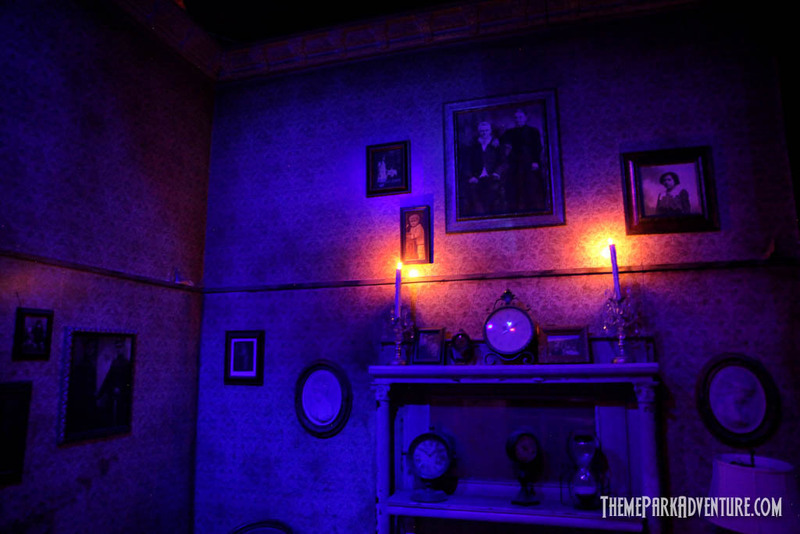 I’m always a sucker for good RP, so I definitely appreciate what the park’s done visually with the theatre during Fright Fest; kudos to them for going that extra mile! 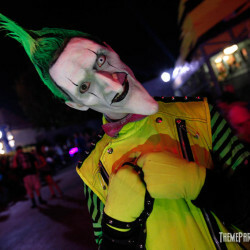 As I mentioned earlier in this story, Fright Fest at Magic Mountain is a strange animal, which daytime guests are welcome to stay and enjoy into the night, while those coming specifically for the Halloween overlay pay an up-charge for a wristband that grants them access to the event’s mazes. 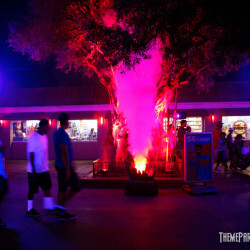 The shows and scare zones are already included in general admission to the park, once the event begins after dark, which the company (and guests) see as a very cool perk to visiting Magic Mountain during October. Now comes the soapbox part of my review. 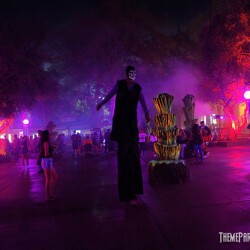 I think the major reason that fans and haunt enthusiasts don’t take Fright Fest “seriously” as a contender at Halloween is the fact that you can purchase a General Admission ticket during the day and stay in the park all night during the event. 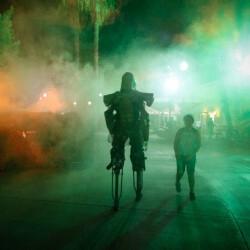 As a result, Magic Mountain can be very crowded, and older guests/monsters have to contend with massive bunches of people, many of them pushing baby strollers or dragging small children through the fog. 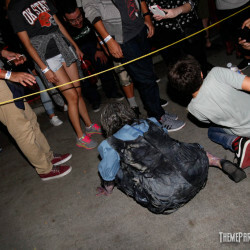 In short, I think that by not making Fright Fest a separate-ticket event, Magic Mountain sends the wrong message to SoCal Halloween fans that their event is half-assed and not to be taken seriously; and honestly, that couldn’t be further from the truth! 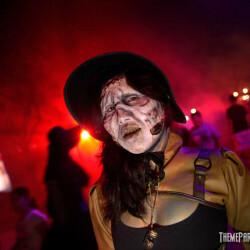 Fright Fest has more mazes, scare zones and entertainment than most large-scale haunts in California. 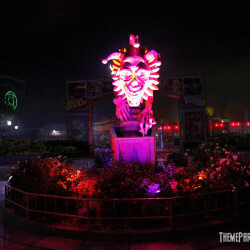 If Magic Mountain were to flush the park of daytime guests and re-open as a hard-ticket Halloween event, people would suddenly take notice and “get it” – that the park offers something special during Halloween; more than decorations and some themed overlays in October. 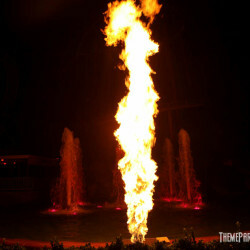 Unfortunately, it’s a company-wide thing, likely completely out of Magic Mountain’s hands. The corporate line is that it’s an extreme value for families and guests – which it is, clearly; too much of a value, in my opinion. 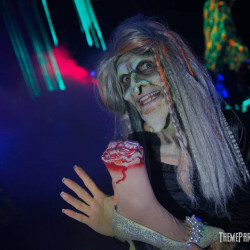 Ironically, as the company/park continues its own financial roller coaster ride that started years ago, the bottom line at Magic Mountain would be stronger with a separate ticket, as guests would spend the extra money to attend an adult-geared scare event. In listening to park management discuss this matter over the past two years, it’s apparent that they are in agreement with their corporate office when it comes to this matter; at least they are publicly. 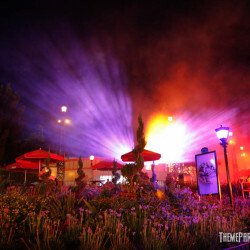 It’s a shame, because I don’t know how seriously Fright Fest will ever be taken regardless of how good it is, simply because it’s tossed in as an “added bonus” to daytime operations during the fall. 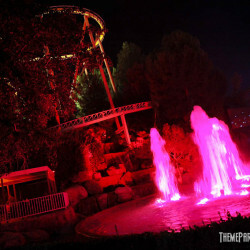 Another issue I think hurting Magic Mountain is the lack of strong advertisement throughout the Southern California region. There are likely radio ads on stations I don’t listen to, and I have seen a couple small billboards in areas of Los Angeles that I drive through when Waze redirects me around freeway jams. 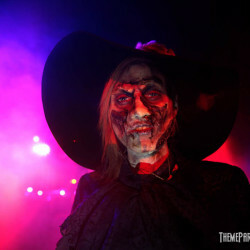 The fact of the matter is, Magic Mountain’s marketing has to be on par with Knott’s Scary Farm’s or Halloween Horror Night’s, if it’s ever going to capture the attention of the massive market here in the Southland. 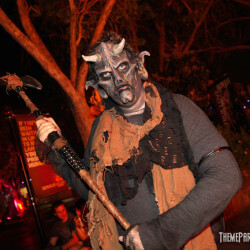 Each year, we hear the same thing over and over from big fans of haunts – “I had no idea Fright Fest was like this!” The writing is on the wall; Fright Fest at Six Flags Magic Mountain is a spooky gem that is hidden in the hills of Los Angeles. 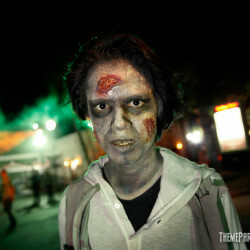 It should be on everyone’s Halloween event list, because it’s a fantastic night out. 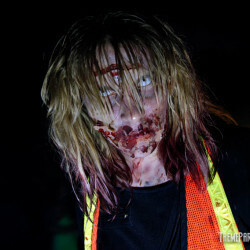 A huge thanks to everyone at Six Flags Magic Mountain for having Theme Park Adventure out for yet another amazing night at Fright Fest! 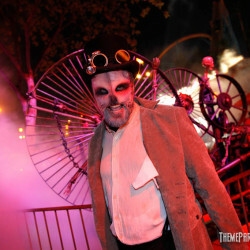 We look forward to it each season, and want to inspire as many haunt fans as we can to get to Valencia to check it out! 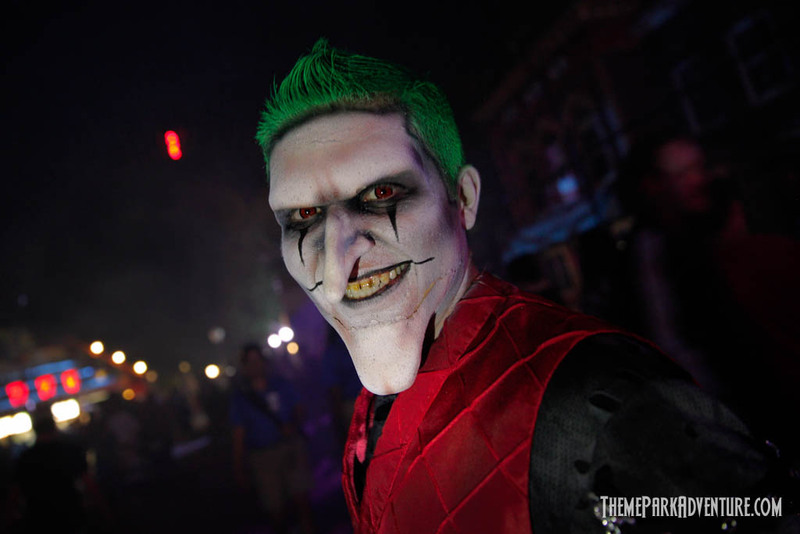 Fright Fest features wonderful talent, incredible makeup (again – kudos to Scott Ramp and his team of professionals), and world-class roller coasters all in one spooky place! This year’s event is fantastic, and we thoroughly enjoyed ourselves – here’s to 2016, which no doubt, they’re already thinking about! 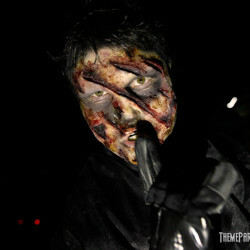 This entry was posted in Features, Haunted Attractions, Home Page, Home Page Slider and tagged Fright Fest, Rick West, Scott Ramp, Six Flags Magic Mountain. Bookmark the permalink.